Gordon Brown's government has laid out the action plan following the Byron Review to 'make the internet and video games safer for children' earlier this year, pledging £9 million of funding for an internet safety awareness campaign for parents. Strangely the state has pledged zero support for similar initiatives to educate parents about age-ratings on violent games, though the plan does contain recommendations for future action in relation to education campaigns related to games ratings. Response from the games industry has been understandably negative. MCV reports that a number of top UK industry execs previously expressed dismay over the prospect of paying for Byron's recommendation of a public awareness campaign to inform parents about the BBFC and PEGI age-ratings systems on 15- and 18-rated games. Secretary Of State for the Department of Culture, Media and Sport Andy Burnam told MCV, non-commitally, that: "Principally, we're looking for the games industry to take that forward." Which, presumably, means pay for it. TechRadar has contacted games publishers' trade body ELSPA for further comment. 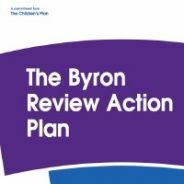 The government has now published its Byron Review Action Plan, launched today by Children's Minister Kevin Brennan, Home Office Minister Vernon Coaker and Culture Minister Margaret Hodge. Whitehall plans to 'raise awareness of e-safety issues among children, young people, parents and other adults through a public information and awareness campaign which will begin in summer 2008 as part of a £9m investment by Government in communications to the public about child safety'. No mention in the Action Plan of Tanya Byron's recommendation of an ad campaign to educate parents about BBFC age ratings on games. "Once the proposals for a new [games] classification system are published, we will begin discussions with industry to develop a full public awareness campaign to make sure that parents are provided with enough information to make an informed decision about what is appropriate for their child. We will be working with the games industry, retailers and the regulators to explore how best this can be achieved. 'The Government will look to work with industry and regulators in establishing a comprehensive public awareness campaign once a new classification system has been published, following consultation. We will then be in a position to establish the full cost of a campaign. 'The Government will look to industry in partnership with retailers and regulators to take forward codes of practice or agreed minimum standards that make the playing of video games safer for children.